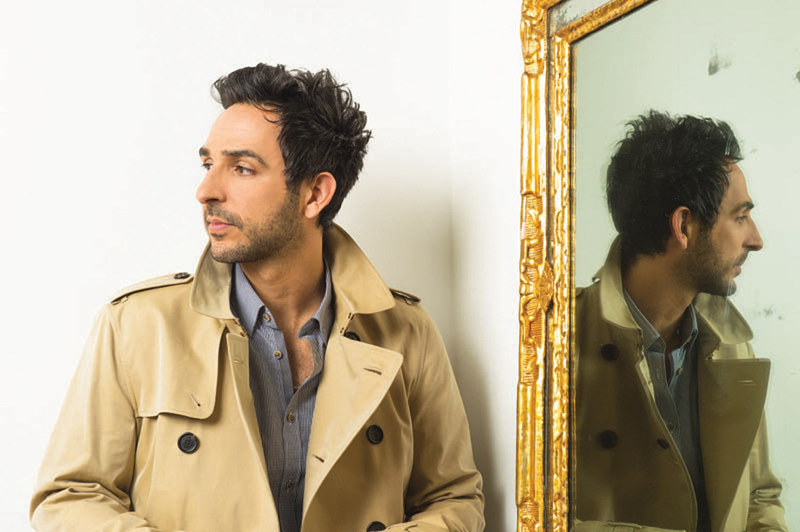 There are a few things that you notice immediately about Amir Arison when you first meet him: one is that he’s tall and handsome, with dark, kind eyes; the other is that you’ve definitely been seeing a lot of him lately. After all, in the past five years he’s been on more than a dozen major television shows, including Homeland, American Horror Story: Murder House, Gossip Girl, and Girls. He’s currently one of the stars of NBC’s The Blacklist, playing FBI Technical Specialist Aram Mojtabai—who is most definitely a fan-favorite. The fact that he plays a tech wiz is not surprising—talk to him for five minutes and it’s clear he’s got serious brains behind those good looks (he was raised by two doctors). It’s also not surprising that Arison’s talent, humor, and gutsiness are the reason his character has such a large role on the show; originally a supporting recurring character, the role continued to grow because the writers and producers of the show liked Arison as much as his fans did. This likeability might be one of the reasons he’s been on so many acclaimed television shows in recent years, but it’s clear the main reason is Arison’s pure talent. He has an extensive theater background that includes numerous notable productions, including several Shakespeare plays (Love’s Labor’s Lost and The Tempest) and the Public Theater’s Why Torture is Wrong, and the People Who Love Them, which was nominated for several awards and received a glowing review from the NY Times. He’s also been seen on the big screen multiple times since his film debut in 2007 (he had three movies that year), and recently produced, directed, and starred in his own short film. Additionally—as if that’s not enough—he teaches young actors, providing guidance to those who hope to have a career as successful as his. Pamela Jacobs: You’ve been on a lot of very successful shows in a relatively short amount of time. Was there one catalyst, or a time that your career officially began taking off? Amir Arison: There was a period of time when Homeland came out, then American Horror Story came out; those were smaller roles, but those shows hit the zeitgeist in such a big way. Then Homeland won the Emmy and everyone started re-watching it, and I remember feeling the impact of being part of something that people were so excited about. Not long after that I got cast on Girls, and that show is such a cultural milieu type of show, so I did feel the difference. It reminded me of some years ago, when I did a movie called The Visitor; it was one scene in a smaller movie, but it did so well on the Indie circuit. It was a Tom McCarthy movie—he’s got Spotlight out now—and I got such incredible feedback. I went to an audition about two years ago and the casting director said ‘I loved you in The Visitor,’ and I was like ‘whoa, I shot that six years ago,’ but it was a reminder that being a part of something great, no matter the size of the role—something that people watch and remember, like Homeland or American Horror Story or The Visitor—is incredible. When it lands and people appreciate it, it does open more doors and it’s thrilling. I’ve been acting my entire life, but all of a sudden around that Homeland, American Horror Story time, I did feel the change. It was exciting. PJ: Your role on The Blacklist has gotten significantly bigger recently. What’s it been like, watching your character’s role grow? AA: The whole role of Aram is, in my view, a miracle. I’ve said this many times: our producing director Michael Watkins was the director of my first episode, and was really encouraging. He became one of the bosses on the show—he hired me initially and encouraged me to make it my own and to have fun with it. An actor’s confidence is like a candle; it’s very fragile, and it’s very easy to get snuffed out, but I got encouraged. Also, through the hard knocks of my career, I had to develop a discipline. Plus, my parents really instilled good values and professionalism in me—be prepared, gracious always. I’m also aware from the struggles I’ve had as an actor, and that to suddenly be a part of something that’s really getting seen, like The Blacklist, I knew that I wasn’t going to take the moment for granted; I was very conscientious of the opportunity and remained extremely focused, prepared, grateful. PJ: I’d heard that very early on, you ad-libbed a line and it was very well received. AA: Yes, that was with Michael Watkins. I remember the line: Meera Malik [played by Parminder Nagra] and Donald Ressler [played by Diego Klattenhoff] run out of the room at the end of a scene after Aram just gave them the location of the target, and I noticed the director didn’t say ‘cut.’ I was alone in the room and didn’t have any more lines, and I knew they could always cut away in editing, so I just said ‘thank you, Aram,’ pointing out that the other characters didn’t thank me, and they still didn’t cut, so I then said ‘you’re welcome,’ and I’m now having a full conversation with myself on a network drama [laughs]. I thought there was no chance they were going to keep that, but I heard from a lot of the writers that that’s when they started to get excited to write for Aram. Truly a miracle. PJ: And it kept growing from there? AA: This last episode [at the time of the interview] that aired on January 7th was more story than I ever, ever could have imagined getting on the show, and it was really challenging material—it stretched me and it pushed me—and every couple of episodes, every season, I’m seeing more. Just like the beginning, I make sure to never ever take it for granted and continue to work hard. Every actor should know that a good script is a gift and they should relish that. As you get more and more opportunity, the confidence grows, but you also have to remember that every actor is replaceable and it can end at any moment. PJ: Can you tell us anything about what we can expect from Aram in the near future? AA: I just got the [latest] script, and it’s very exciting. I’ve heard some rumors about what’s coming down the pike, and The Blacklist is not going to disappoint. Towards the end of the season, things are going to kick up to another level. PJ: You mentioned your parents. They’re both doctors—were they always encouraging of your acting career? AA: My mom was always encouraging of it; my dad: ‘You’re a smart kid, you can do so many things. Acting is such a tough career, why do you want to put yourself through that?’ But he eventually switched and got onboard. This last episode that aired, it ended at 10:00 pm; at 10:01 he called me: ‘Alright Amir, that was something’. It gave me goose bumps. My mom’s been encouraging me since I was eight years old, first telling me ‘You have talent!’ After a while when people would ask me, ‘are you going to be a doctor like your parents?’ she would say, ‘no, he’s going to be an actor,’ before I could even answer. She saw my love for it and encouraged me. I did some commercials when I was 16, and when my dad saw they were sending me residual checks, he said, ‘They’re sending you more money? Okay, maybe you want to do more of this!’ The best part, though, as I got older, was when I was struggling, he never told me to quit. He would say, ‘This is your chosen profession. You have to work hard, study, show up.’ There is no good fortune in my life that isn’t a direct result of my parents’ love and my upbringing. PJ: You have a very strong theater background. Is theater your first love, and do you think you want to return to it in the future? AA: I did a play a year and a half ago, and I recently did a couple of theater readings. One of the great things about doing Blacklist is we are in New York, so I can reconnect with the theater community. I just did this crazy reading of a satire for the Williamstown Theater festival with David Hyde Pierce and an old friend of mine, John Pankow, and all these incredible actors, and I loved it. I have become a TV animal [laughs] and have been working pretty steadily in TV for the past five years—but before that I was a theater animal, doing play after play after play. I think I’m where I’m supposed to be right now. I’m having more fun with television at the moment, but theater is vital to my organs. PJ: You’ve worked with some incredible people in television and film, some really big names, including Jessica Lange, among others. AA: I’ll never forget working with Jessica Lange on American Horror Story. That was a front row seat to mad excellence. PJ: Would you say she was one of the most exciting, talented people you’ve gotten to work with? AA: Absolutely. Interesting human beings are complicated, and funny, and strange, and so are great actors. Jessica Lange, James Spader, Lena Dunham—these are three of my favorite people who I’ve gotten to work with, and they’re all remarkably different. As an actor, your first job is to listen; when the person opposite you is incredibly dynamic or fascinating, it’s very easy to listen to them. So if that’s the type of actor you’re working opposite, the easier your job is. It’s a treat. I always think of acting like a ping pong match; hitting the ball back and forth, and if you’re hitting the ball with someone really great, it raises your game, too. PJ: Tell me about your upcoming movie, Jane Wants a Boyfriend. AA: I shot that while I was doing season one [of The Blacklist]. It’s a really sweet romantic comedy, or dramedy, about a girl [Jane] on the autism spectrum, played by Louisa Kraus, who is wonderful. Her older sister, played by Eliza Dushku, is the overprotective sibling, and I play her fiancé, Rob, who is trying to get this marriage and his job on track. His best friend, Jack—played by Gabriel Ebert, an incredible Broadway actor and now a good friend of mine too —is a player, so to speak, who wants to ask out Jane against all odds. It’s all very sweet, and had a great team, it was lots of fun. It’s coming out in the spring. PJ: And that’s not the only film you’ve got coming out, right? AA: I did another movie this past summer called Before the Sun Explodes, where I play this creepy, needy, hapless guy, kind of a stalker. I’m not allowed to say specifically, but I can tell you it’s premiering at a very big festival soon. And then there’s my labor of love—my first short film that I produced, directed, and acted in, this past summer—which is also just getting to festivals now and will be premiering soon. It’s called Fortress and it was written by an incredible playwright named Anna Ziegler, and a lot of my Blacklist colleagues helped me make it. PJ: So is that something you want to do more of in the future [producing and directing]? AA: I’ve directed a little in the theater. I’m happily employed as an actor right now, but I do plan on directing more and more. I look at some of the actor/directors, especially in television—David Schwimmer, Andrew McCarthy, Laura Innes, Eriq La Salle—they were all on shows that did well, which allowed them to direct. So that is an aspiration of mine. I do love storytelling and being at the helm; it engages a different part of me than acting does—my intellect, my organizational skills, vision in a different way. Andrew McCarthy told me he finds ‘acting less stressful, but more anxiety producing, whereas directing is less anxiety-producing, but way more stressful.’ I have found that to be very accurate. PJ: And you teach as well, correct? AA: Yes, that was a goal of mine. When I got The Blacklist, I knew there wouldn’t be a lot of time for other acting roles, so that’s when I said I would pursue some other professional goals in my life, like directing and teaching. I had just said to the universe, ‘I really want to do some teaching in my spare time.’ And then out if the blue, a dear friend of mine, Yvette—she works at a company called Broadway Workshop—she came to a play of mine and said, ‘Do you teach, by any chance?’ I said, ‘how are you knowing to ask me this right now?’ Within a few weeks I’d taught my first class at Broadway Workshop, which takes a lot of teens and pre-college students who do theater. I love it. PJ: Does it remind you why you love acting? AA: 100 percent. Working with young actors, it reminds you of the purest joy and urge for storytelling. And the high you get—they’re sitting on something that they want to express, and they don’t fully know yet how to express it, and I remember that feeling. It’s so great when they get it, when they’re working on something and you see that they have talent, and you encourage them and get their flame up (the candle metaphor is back!). It’s often hard for us to give ourselves permission to do something scary. Actors have to give themselves permission to go for it, both in career and in acting choices. Younger actors are often afraid to do that, so it feels natural for me to encourage them, and to see them break through is very rewarding. So what’s on this actor/writer/producer/teacher/New Yorker’s list of favorites?